Zombies, Run! fever is spreading – Zombies, Run! If you weren’t able to make it to our SXSW panel in Austin, Teaxs, we’ve got the full audio of the talk available to download. While you’ll miss out on seeing their lovely faces, you’ll still be able to enjoy hearing CEO Adrian Hon, Director Matt Wieteska, Lead Developer Alex Macmillan and Lead Writer and Co-Creator Naomi Alderman talk about what makes the game so successful and how immersive storytelling is the future of fitness games. Again, Camilla Luddington mentions us in an interview on the Nerdist podcast. We’ve not even asked her to do this, we swear! Check out the full interview over at the Nerdist website. Remember the London-based Loading Bar crowd-funding campaign? They’ve found a potential venue in the heart of Soho and organised an open day to test the waters. A few Six to Starters were in attendance to check out the unique game-influenced cocktails and play a few rounds of Micro Machines on the SNES. The best part? 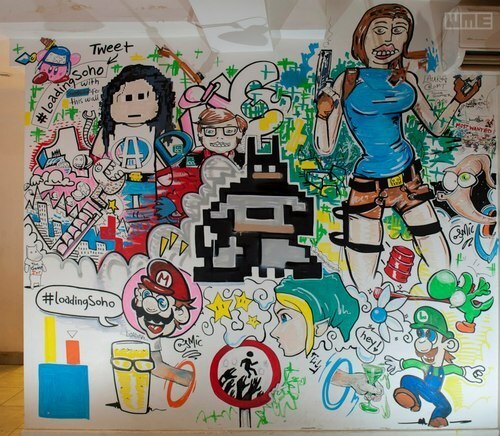 The resident artist, Cosmic Images, was filling the walls with game-related artwork throughout the day. 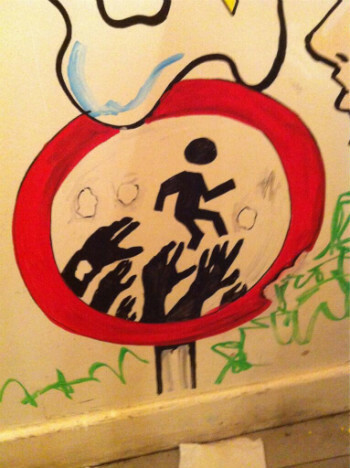 Including, as you may have already spotted, the Zombies, Run! logo. Rubbing shoulders with the likes of Link, Batman and Lara Croft(‘s scary, toothy sister). We were included in HackCollege’s Gamification of Fitness round up video. Worth checking out, over at the HackCollege website. Development on Zombies, Run! 2 is going really well. We’ve just started another batch of voice recording and we’re well on track for our April 16th release date on both iOS and Android devices. Even despite half the team gallivanting off to Austin to attend SXSW! In order to prepare ZombieLink for Zombies, Run! 2 we’ll be taking the servers offline for hopefully no more than a couple of hours, starting at 11am GMT on Thursday, 21st March. During this time, you won’t be able to upload or download any run data or base data to or from your device. Don’t worry though – once our servers are back up, any runs performed during this time will sync with no problems. The ZombieLink website will also be down, so you will be unable to login or view any run records online. We’ll be tweeting live updates during the process, so keep an eye on @zombiesrungame to know exactly when the website will be up or down.